I was interested in the exhibit for several reasons. Before, during and after World War II, the giant Philadelphia Naval Yard built and serviced many the country’s battleships and other vessels. Asbestos was used extensively for insulation at the Naval Yard, and tens of thousands of workers in my home town were exposed to it. I was also in the Coast Guard, and ever since I have felt a connection to those who work in America’s ports. But there was another reason too. As a newly minted attorney, my first job was a clerkship for the judge who was presiding over a flood of asbestos cases brought by Naval Yard workers 40 to 50 years after they had been exposed to this hazardous material. Almost every day for a year, I heard these men’s stories. All suffered from mesothelioma, lung cancer or asbestosis. None could breathe easily and all were seeking recovery from asbestos companies that had failed to warn them about the dangers they were exposed to. It was difficult to listen to their stories and impossible to forget them. My solidarity with these fallen workers also comes from sharing a courtroom with them. 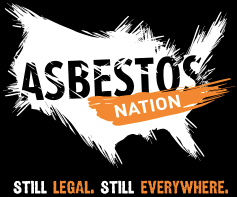 Over the years, millions were affected nationwide in a range of asbestos related businesses. As illness becomes apparent—asbestos lodges in the lungs and takes decades to manifest its injuries—the flood of lawsuits led to a 30 billion dollar trust fund established by the asbestos industry to provide compensation for worker claims. But asbestos itself has never been banned as a hazardous product, and according to one watchdog group, has resulted in approximately 200,000 additional deaths between 1999 and 2013, and another 12,000-15,000 every year since. These badges personalized this large group of harmed ship builders, construction insulation workers, and more recently the 9/11 emergency responders I photographed on Ground Zero. If in my subject’s employment or work experience they have been diminished, I need to show the causes of that diminishment, wherever that takes me. Earl Dotter tells worker stories. To do so, he takes pictures, collects photographs, and tracks down memorabilia. It has been his job for most of his adult life. As he said elsewhere: “It was after the tragedies of 1968 [the Robert Kennedy and Martin Luther King assassinations] that I decided to fully devote my creative energy to socially useful photography.” The social use that he had in mind was improving working conditions in hazardous industries. Because he became convinced that working with asbestos could never be safe, he has also been telling everyone who will listen that it should be banned forever. It is always interesting to learn how someone like Earl Dotter settles on the work of his life. When I conduct interviews about work, this is always my first question because the answer tends to illuminate everything that follows. Not too many photographers carve out this subject [hazardous work] as their own today and I still can’t figure out why. Sometimes, when entering a factory, I feel like I am on a movie set with colorful actors of all descriptions populating the moving stage. But what is even better, is it is real and a visually engaging opportunity for me to do useful work too. For Dotter, being around men and women who were making things was exciting—a real life theater—and as he got to know these workers better, he wanted to help them as only he could. 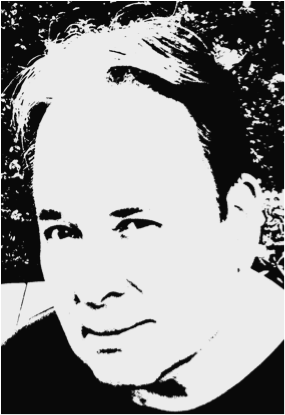 You can see Earl Dotter’s photography at his website. When he’s not storytelling, he is also a Visiting Scholar at Harvard’s School of Public Health and an advocate for worker safety. 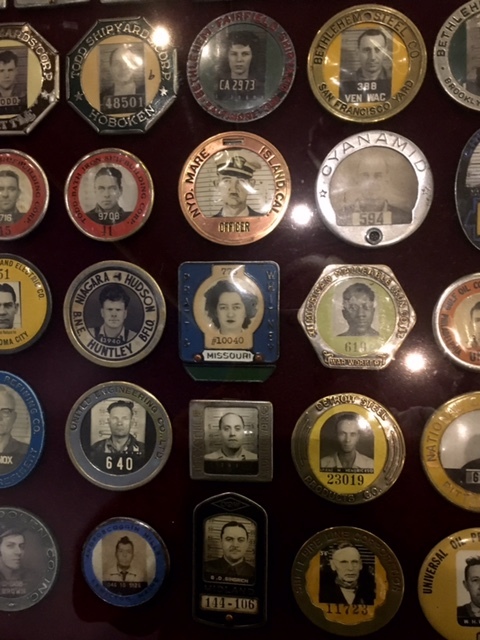 The Badges Exhibit was originally scheduled to close on September 1, but has just been extended through mid-November. Additional information about it can be found here. This Labor Day, when it is harder to find a factory where workers make things, this story about workplace hazards may seem passé. In the dangerous industries that remain, there are occupational safety laws and far greater accountability than the workforce enjoyed in the heyday of the Philadelphia Naval Yard. But there are still asbestos-related injuries and deaths, and workplace safety concerns continue to stalk many industries such as fishing and coal mining. Moreover, unless you make your own work (like Dotter has done), work generally strikes a balance between the needs of those who “own the means of production” and the workers “who produce.” Sadly, those needs are not always the same. Labor Day is a day to celebrate the fairness (and successes) of that balance when it is struck, but it is also for considering how to maintain that fairness in an era of rapid change. Our jobs today will be transformed by increasing automation from both robotics and artificial intelligence. Will we be helped by these developments or harmed by them? 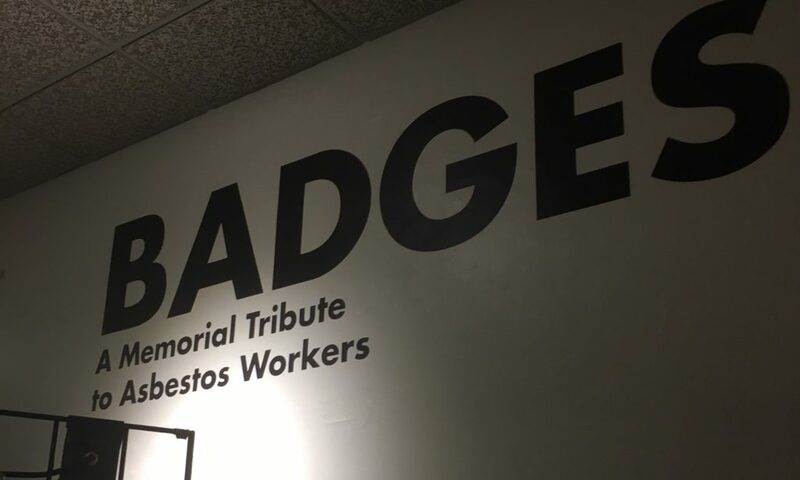 Given the future of our work today, this cautionary tale about America’s asbestos workers could not be more timely.